We left off with Action Comics 99, when the large logo in its rectangular box was greatly reduced in size to make more room for titles and such. This remained the same for many years. Around issue 242 the logo lost its tilt, as above, but was otherwise unchanged for another long while. The comic was selling well, the logo was classy, and no one saw any reason to change it, I imagine. 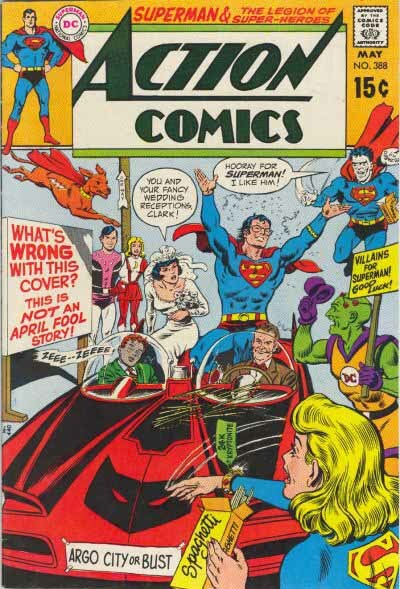 As the 1970s began, with competition from Marvel Comics having an impact, DC Comics started making more design changes on all their covers, trying to find an appealing formula. Small character figures were appearing in the logo area on some titles, as above. This followed a lame attempt to be hip: the “go-go checks” idea of adding a checkerboard pattern at the top of all the comics, which everyone I knew reading comics at the time thought was laughable. I’m not even going to show an example of that one. 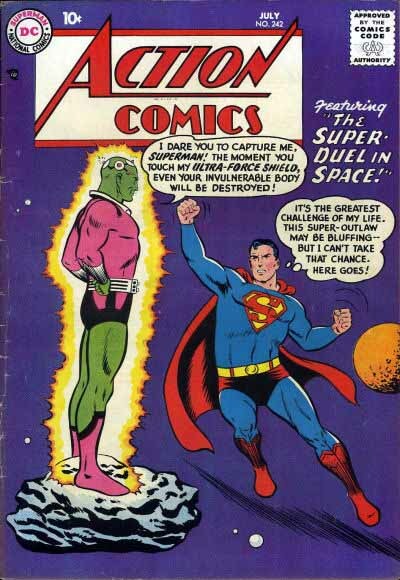 For a while the original logo came back, along with a Superman head-shot, as shown above, but I think when Carmine Infantino took over as publisher of the company in 1971 he wanted to move away from having such a large area devoted to the logo and trade dress (all the other type and stuff up there), and DC gradually gravitated toward all floating logos, as below. 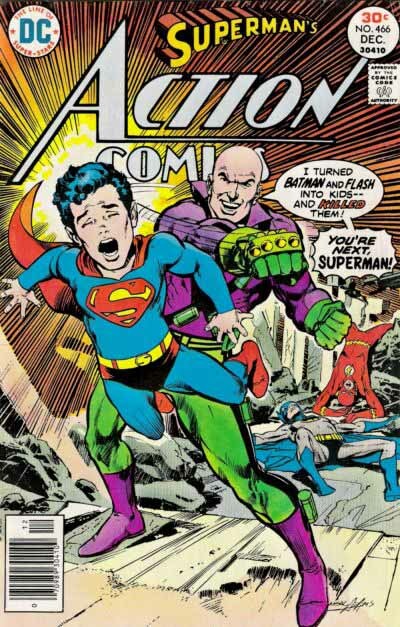 On this great Neal Adams cover, the background art is allowed to carry the image behind the entire logo, making for a more dynamic and integrated cover. But the old logo, now with “Superman’s” added at the top, still took up a lot of space, and soon after, a new version, the first real change since 1938, was introduced. While retaining the concept of the original logo, John’s version made all the strokes in ACTION wider, connected the A to the N, put a horizontal serif on the left side of the A, and redid the word COMICS to make it wider and heavier as well. The entire logo has been compressed vertically to give the cover art a little more space. Unfortunately, the word “Superman’s” still takes up a lot of room, and leaves an awkward dead area below it. That was often moved around to different locations to accommodate the art on each cover. One good thing is that the logo was still easily readable and recognizable to previous buyers. This version also lasted for many years. Why do logos get changed or revised? Often it’s when someone new takes charge of the book, whether it be a new cover designer, new editor, or new art team. One of the ways to alert readers to changes in personnel is with a new version of the logo. That’s what happened when writer/artist John Byrne, most famous for his work at Marvel Comics, was brought in to revamp and relaunch all the Superman titles in 1986. Though I had created many logos for DC, having been on staff and freelancing for them since 1977, when I was asked to come up with a new Action Comics logo for the Byrne revamp in 1986, I felt, much as John had, that there was little I could do to improve on the original. But I had to come up with something! My solution was to super-size the A, giving it top billing. A is for Action, after all, and the diagonals always give it lots of that. the letters CTION are very close to the forms of the original logo, but the N is cropped to match the rest, leaving more space for titles at the top. COMICS is greatly reduced and inserted into the bottom bar flowing out of the A. And finally, a horizontal drop shadow was added to help hold the logo together against any sort of background. I think this version worked pretty well, though I’m now not sure I like the overlap of the C on the A. 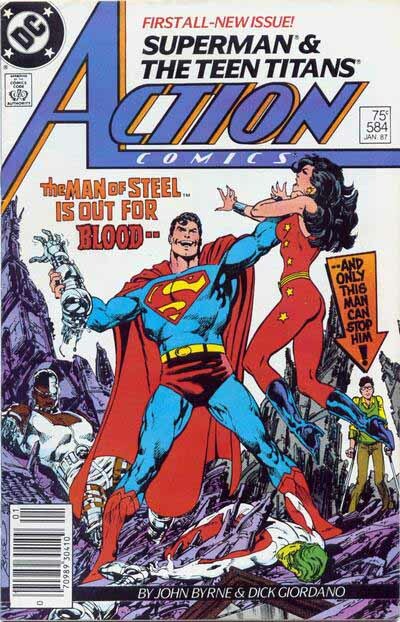 Next time I’ll talk about the revision of the SUPERMAN logo in the 1980s, and more! This entry was posted in Logo Studies on August 11, 2007 by Todd. 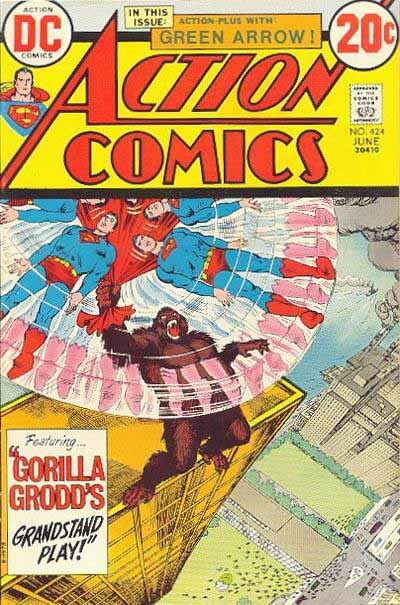 Not to be Mr. McPickyPants, but if Infantino took over in 1971, and you show a cover that appeared in 1973, then one that appeared in 1976 as an example of freeing up more cover space by removing the banner behind “Action”, then it sure took him a heck of a long time to get that accomplished! Fair enough, and as I wasn’t there, I don’t know the process or reasoning involved, I’m just guessing. 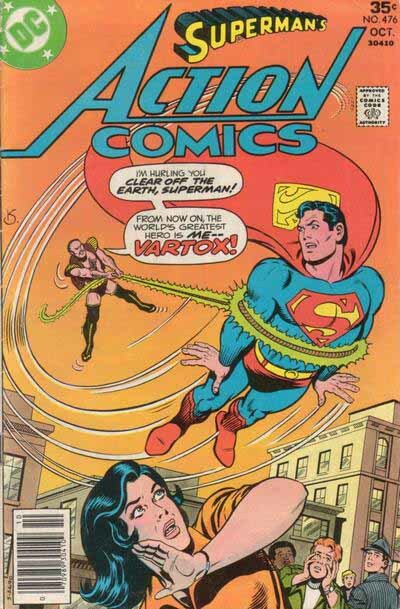 The first cover to have an open logo in that era was issue 439, from September 1974. Many after that still had the big box behind it. It was a trend that gradually took precedence. It may have had nothing to do with Infantino. I think I’m a little surprised to learn that the go-go checks were so ill thought of! I do see how, as a design element, they’d be ill-thought of. I always wondered how the Vertigo types dealt with a rather large margin running down the left side of covers–an element that I never cared for, although it did provide distinctive dress. Todd, thank you so much, this is just what I wanted – truly fascinating stuff. You, sir, are the Coliseum.